Conservation-minded landowners and instream habitat work can reduce erosion, meaning cleaner water and more trout with less stocking. These improvements, combined with a wetter climate, have resulted in more trout available now than at any time in the past 30 years. 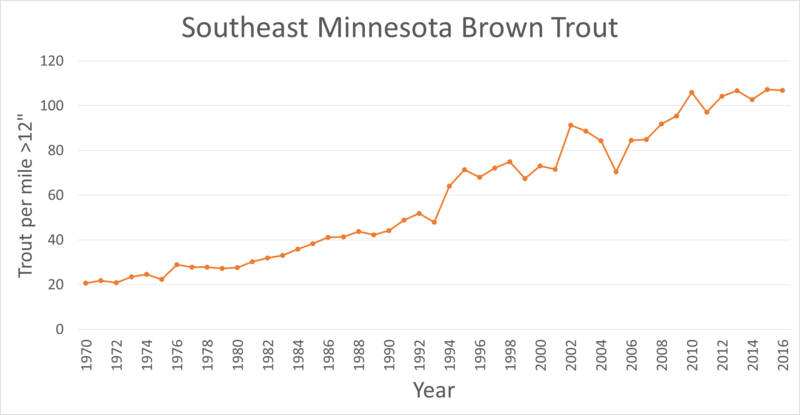 According to more than 2,400 DNR fish population surveys, trout numbers in southeastern Minnesota have doubled since the 1980s. The overall population increase doesn't guarantee good fishing every time. Trout populations still tend to fluctuate from year to year as floods and other factors affect natural reproduction. Three other factors to consider: growth, fishing pressure, and habitat also affect trout populations, especially the number of large trout. Good growth and suitable habitat are needed for streams to support larger fish. Also, heavy fishing pressure and harvest can have a negative effect on trout size and numbers.